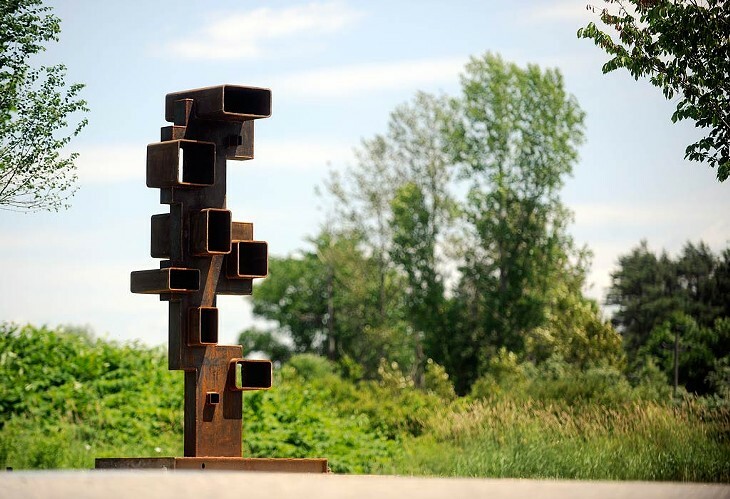 Every summer for the past 23 years, the "Exposed" outdoor sculpture exhibit has transformed the village of Stowe from a tourist town to ... an artier tourist town. Whether visitors come specifically to see the artwork is impossible to determine, but Helen Day Art Center's Rachel Moore — for the past four years the show's curator — would like to think so. "People look forward to seeing it," she says. "Our vision is to make it a destination." While Stowe is home to a number of galleries, Moore posits, "Exposed" is "the only really visible display of work" in town. 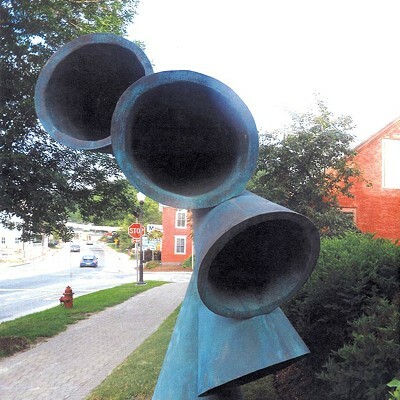 "Exposed" definitely merits a visit on its own, and — from the town's point of view — so much the better because taking in all the sculptures could entail a walk or bike ride on the excellent rec path, browsing in the shops and dining at a downtown café. You'd think the town would be underwriting the exhibit for its tourism-enhancing value. Not true. But, Moore points out, "This year and last they've given more support surrounding safety" — meaning that town engineers pitched in to help secure and stabilize each sculptural site. Those are significant issues when it comes to public art. Moore acknowledges that in the past, "people have vandalized, tipped over and even stolen" works from the exhibit. That probably explains why more sculptures are sited along Main Street this year and fewer on the more secluded rec path. Moore concedes, too, that the current exhibit has fewer pieces than last year's — 18 sculptures compared with 25 in 2013 — although the numbers have fluctuated over the years. The curator notes that she intentionally limited the selections to maximize the quality and the artists' geographical proximity. "It's an enormous expense to create, bring, install, maintain and de-install the work," Moore says. "We can't afford to offset all of that." Helen Day's funding comes primarily from individual donations; this year, Petra and Stephen Levin also underwrote "Exposed." As Moore declares in the show's accompanying catalog, "the sculptures in 'Exposed' are fewer in number [this year] but grander in scale." She doesn't necessarily refer to size; few pieces in this year's selection are outstanding in that respect. 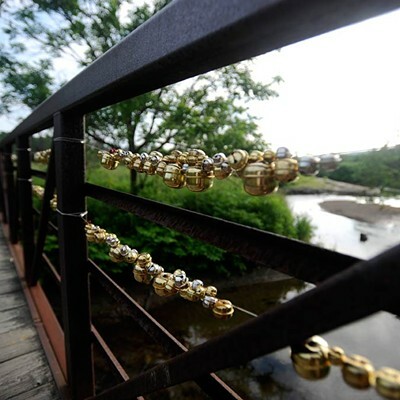 Rather, Moore writes, "More than ever, the public art is a call to connect." That's true, for attentive viewers. 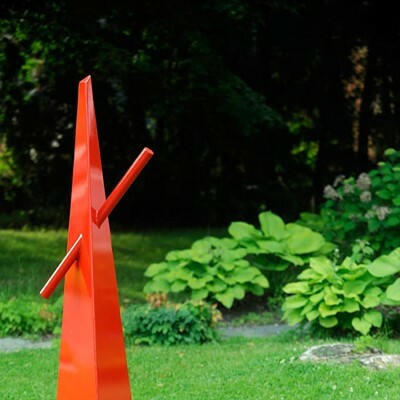 While some of the sculptures are more assertive, such as the bright-red steel projectile/pyramid titled "Beginning" by Judith Wrend, or the amusingly interactive "Pendulum Face" by Oliver Schemm, some of the most "connecting" pieces in this show are easy to miss. Case in point: Jodi Colella's "Reliquary," nestled in the branches of a tree on Main Street. This multipiece installation consists of "man-made objects composed into anthropomorphic bundles, each painted to simulate bronze statues," writes the artist. Half a dozen balls of what might be yarn, fabric or rope rest in the tree's main bough. Perched on a branch overhanging the sidewalk are several assemblages of household objects; pant legs dangling from one of them imply human presence. This entire collection seems like a memorial to domesticity, ordinary yet rich, and discovering it in a tree is a unique pleasure. Susie J. 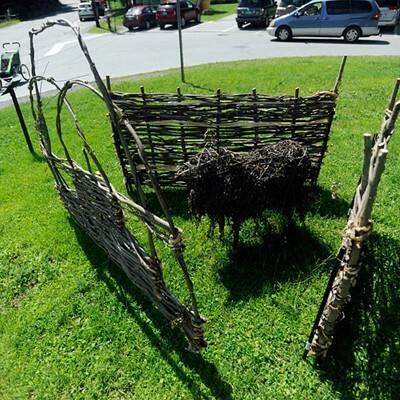 Gray's "The Sheepfold," made entirely of dried, woven willow branches, sits on a patch of grass between the gallery and Main Street. Inspired, Gray writes, by traditional woodland crafts of England, she created a three-sided "hurdle," or fence, inside of which stands a single sheep. The whole thing is child-size, a scale that evokes a sense of playfulness even in grown-ups. Incidentally, Gray's 2013 "Looking East, 6 Degrees North," a cozy woven-willow enclosure along the rec path, is the only sculpture in "Exposed" to have been allowed to remain year-round. "The town loved it," Moore explains. 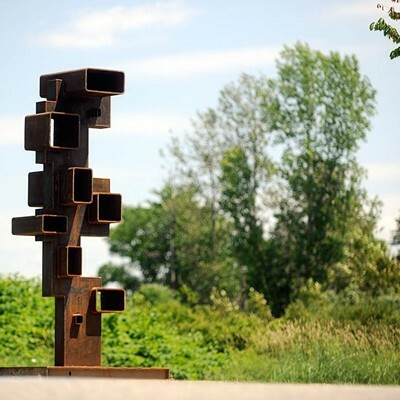 As such, the piece is the sole example of environmental art — the kind that is left to return to nature — in this outdoor show. That's a curious lack in an exhibit you would think might inspire site-specific work à la Andy Goldsworthy. 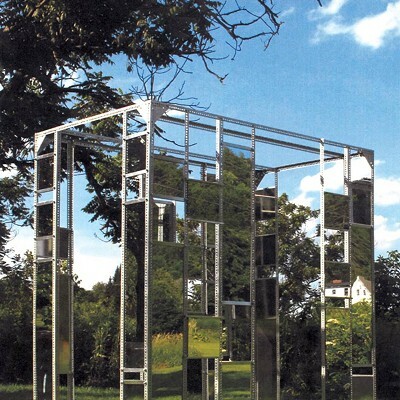 The only other piece in this year's selection that invites viewers to step inside it is far from "natural": Karolina Kawiaka's "Fractured Reflections" is a tall, rectangular armature of metal with random panels of aluminum mirror. It suggests a remnant of modernist architecture with a side of Modigliani — and flashes of your own image. But, regardless of materials, art that can surround you affords a more visceral experience than do pieces you simply walk past. Enclosure — whether perceived as comforting or claustrophobic — is a powerful thing. Still, just looking can be rewarding, too. 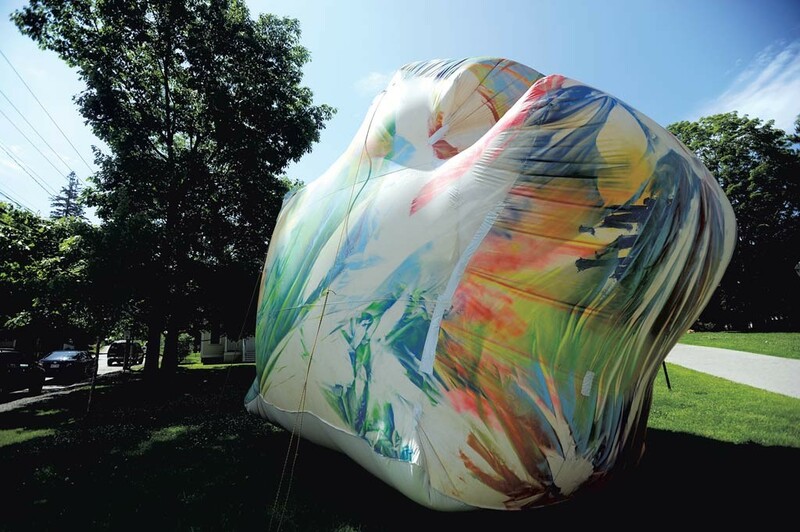 Claire Ashley's "limppunklovejunk" and "RUD" are huge inflatables of spray-painted, PVC-coated canvas. Positioned atop the Helen Day's porch roof and on the lawn, the two amoebic shapes look like they would galumph off into town if not held down with ropes. Ashley is successful in her goal to "create objects that engage in intellectual play." Her pillowy forms incite joy. "Exposed" does offer serious fare, as well. Witness Gregory Bailey's "Prophecy," sited on Main Street. The cascading conical shapes look like bronze but turn out to be fiberglass painted with bronze powder. The artist's theme, however, is still heavy: climate change. "Climate scientists have received a prophecy, via data-collecting devices, including satellites orbiting in the heavens," Bailey writes. "Is it possible that we are ignoring a divine communication?" Yes, it is certainly possible. But until the climate apocalypse, we'll continue to appreciate the messages of art. The original print version of this article was headlined "Standing Out"
SCAN this page with layar to see more of the "exposed" sculpture exhibit.